ESPN's Stephen A. Smith picked up some furniture at Raymour & Flanigan (2100 Route 38) in Cherry Hill earlier today and referred to himself in the third person while shopping, says a nearby customer. "Stephen would like the sofa that Stephen was just sitting in," our source quotes Smith. Jesus, just when I couldn't imagine this guy being a bigger toolbox, he outdoes himself. Or, should I say, Stephen outdoes Stephen. OK, on to business. I'm beginning to wonder if the draft couldn't be a bevy of 1st round quarterbacks. With Alex Smith, Brodie Croyle, Kellen Clemens, the carousel of Atlanta quarterbacks and the eternal mediocrity that is Kyle Boller, we could be looking at a number of QBs taken in the first round. Also, with the Eagles placing the bidding for McNabb at a 1st and 3rd, we could get a whole new generation of QBs taken often and early. Gotta say, with USC up 49 to 17 over a completely overmatched Illini team, why did Pete Carroll keep running plays as time wound down? Why not tell his players to take a knee? Instead he kept running plays getting to the Illinois 4 yard line when time ran out. Not sure why, but it seemed unnecessary to me. Listening to Randy Moss this week, it reminds me of what my father used to say; "Once a jerk, always a jerk." I might write more on this later, but the fact that Randy said what he said: "I don't think me breaking Jerry Rice's record is special. I think shutting you guys up is what made it special, all the negativity, all my critics." makes me angry that this piece of crap has all this talent, but absolutely no love for the game, or respect for who played it before him. Looking at their roster and their managerial moves this off-season, I think the K.C. Royals might improve more than a little this season. Not that they are gonna compete with Boston or anything, but they might be a damn sight better than they have been the past couple of seasons. Just read the November's Men Journal article on Steve Nash (I am a painfully slow reader sometimes) and it reminded me that if I still watched basketball as religiously as I used to, he would be the guy I idolized. For everything he does on the court, and off. Of all the bowl games, I might have had the most fun watching the Air Force-Cal game. High-scoring, spirited and fun. And the Air Force Falcons have a bitchin' helmet. And finally, only 113 days until the Jets get to draft, which is about half as long as this hellacious season felt like. Stephen A. Smith has the ego of Howard Cosell without the eloquence. I couldn't stand Cosell either, but he was no dummy. The only way to tolerate Stephen A. Smith is to change the channel. I find myself watching figure skating sometimes, but it's worth it. A first and a third for McNabb? The Jets should consider it if they can get get the Eagles to take next year's first and third. It would be worth it, because the Jets will have a better season next year. It would be nice if one of those heat seeking missile safeties like Bob Sanders or Troy Polamalu could put the smack down on Randy Moss during the play-offs. They would have to go out of their way, though...Moss is a sissy, so Welker gets to take all those hits on short crossing routes. 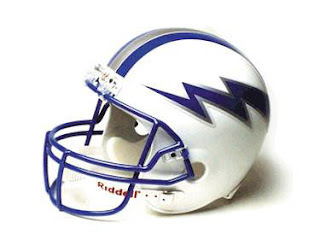 Good call on the lightning bolt helmet...it is sweet, albeit odd for a team that runs a "flex-bone" style offense. How did that Air Force helmet sneak under my radar. I consider myself an aficionado of sports uniforms, that that one is definitely classic! Thanks for the comments guys. Steven A. Smith is just an amazing fool. Can't believe that guy is paid to open his mouth. And yeah, the Air-Force helmet is what helmets should look like. Not that Tennessee crap.